MadPea: MadPea Mid Month Madness! The Green Mire houses our MadPea main-store with brand new items and gacha! However.. it wouldn't be just MadPea to have a location without a good mystery! This location has a story to tell and much for you to try and figure out on your own. 10 years ago, young boys Tony Lamil and Skip Dares went missing at the Green Mire swamp. A reward is being offered for any information leading to the location and/or safe return of the boys. By venturing into the swamp, you voluntarily discharge MadPea from any and all liability. Including, but not limited to: mental damage, or actions of any kind which may hereafter occur to you including traveling to and from this event. Green Mire is open until October 30th. Two boys have been missing for ten years. They vanished into the swamp, without a trace. 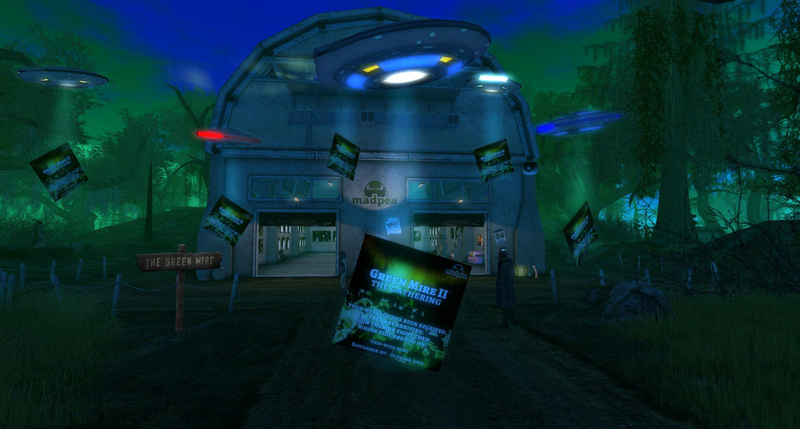 Now, strange lights and sounds have been observed over the Green Mire swamp, and the believers call out that aliens are returning. Others are skeptical. It's up to you to figure out what to believe, in a dangerous place where nothing is quite as it seems. Choose your side, follow the path, the truth is out there. Join the grid-wide hunt! Open until October 30th. Samantha "The Mantis" Mason, is an internationally infamous serial killer due to her particularly gruesome hobby. Seducing men and women alike, she lured them with the promise of fulfilling their lust, only to appease her own thirst for blood with these hapless pleasure-seekers. Society breathed a collective sigh of relief when, after 8 brutal murders she was finally apprehended and brought to justice. However, a year after The Mantis was put behind bars murders have started occurring again, and the sadistic killer operates in a way that keeps everyone in fear. The players will take on the role of a Private Detective and get prepared to solve a grisly series of shocking murders to test the boundaries where eroticism meets morality. MadPea is proud to sponsor Cirque de Seraphim, a sim-wide sales event featuring designers with new, circus-themed creations. The event is to benefit ASPCA, American Society for the Prevention of Cruelty to Animals. What would December be without a good old MadPea Advent Calendar! New sim coming with a new twist.. It is Free to join our groups and stay up-to-date with all of the Madness. Check out the group gift section at our Mainstore.